In the Manage Module, click tsi Collections. Click Unsent Accounts tab. TSI will handle all debt collection activity for all accounts sent to them. To set up the service, see TSI Setup. To send, suspend, reinstate, or cancel an account, see TSI Sent Accounts. Open Dental aging will run and all guarantors who have a balance based on the account filter criteria, and have not yet been sent to TSI, will list on the Unsent Accounts tab. Accounts highlighted in red indicate the guarantor has an invalid birthdate entered or is under the age of 18. Account Filters: Change the filter criteria as needed. To save criteria as the default for the next time you run the report, click Save as Default. Clinics: Only available when clinics is turned on. Filter by guarantor's clinic. Defaults to the clinic selected in the main menu. Click the dropdown to change. Providers: Filter by guarantor's primary provider. Click the dropdown to change. Billing Types: Filter by guarantor's billing type. Click the dropdown to change. Account Age: Filter by account age. Minimum Balance: Only show guarantors who have a balance over a specific amount (e.g. only show accounts with a balance over $25). Days Since Last Payment: Only include guarantors who have not made a payment in a specific amount of days (e.g. only show guarantors who have not made a payment in the last 90 days). Exclude if insurance pending: Check this box to not show guarantors who currently have an outstanding claim. Exclude if unsent procedures: Check this box to not show guarantors who have procedures in their account that have not yet been sent on a claim to insurance. Exclude bad addresses (no zipcode): Check this box to not show guarantors who have no zip code. Show PatNums: Show patient numbers next to guarantor name. Defaults to the setting in Report Setup: Misc Settings for Show PatNum. All family members associated with accounts sent to TSI will be assigned the C billing type as an identifier. There should only be one C billing type. If there are multiple, the C billing type listed first will be assigned. TSI will send statements on your behalf for patients with the C billing type. Exclude this billing type when running billing so the patient does not receive duplicate statements. Do not manually assign the C billing type to any patient. Manual assignment will not initiate TSI account management. Thus, the account could fall through the cracks. Do not manually change a patient's billing type from the C billing type to another. Manual changes will not stop TSI account management, but will stop account syncing that could result in double, yet different statements. Guarantors - Not Sent to TSI: Add or remove columns in Display Fields, A/R Manager Unsent Grid. Prov: The guarantor's primary provider. Billing Type: The guarantor's current billing type. 0-30: The balance that is 0 - 30 days overdue. 31-6- Days: The balance that is 31 - 60 days overdue. 61-90 Days: The balance that is 61 - 90 days overdue. >90 Days: The balance that is more than 90 days overdue. Total: The total balance due. -Ins Est: Any pending insurance payment estimates. =Patient: The estimated patient portion due. PayPlayDue: Payment plan due amounts. Date Last Pay: The date of the last payment of any family member on the account. Date Time Suspended: If the account is currently suspended with Transworld, the date and time when it was suspended. Last Proc: Date of last completed procedure for the family. Date Bal Began: Date the patient balance began. Days Bal Began: Number of days ago the patient balance began. Guarantor Count: Total number of guarantor accounts in list. 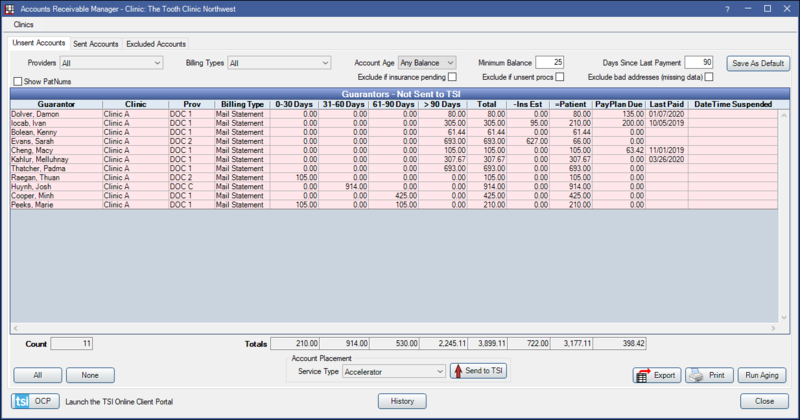 Total: Total sum of accounts for each column. tsi OCP: Click to launch the TSI client portal. Right click on a guarantor, then select Go To to jump to their Open Dental account. Click Run Aging to manually run and update aging.